Ambrosia and Bliss: I need a time machine! I need a time machine! I don't know where the summer went. I've been super busy dyeing and spinning and gearing up for the Fall Fiber Jubilee but I keep thinking of more things I need to do. Since this is my first show, I am flying by the seat of my pants. It's anyone's guess how much I'll need to bring or what will even be popular. My Etsy shop has already taught me that my favorites are not the same as everyone else's. I've been cranking out batts as fast as I can and today is a big yarn dyeing day. For anyone who isn't dyeing, this is National Alpaca Days weekend. Find a farm near you and go check them out! 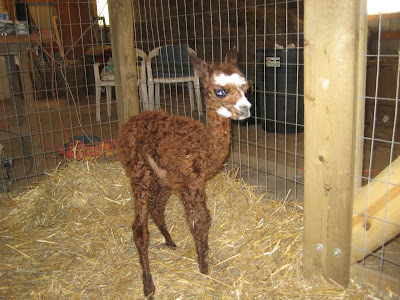 I was going to do a spinning demo today, but a friend's alpaca finally had her cria yesterday and I was up too late last night. Between that and needing to get ready for next weekend, I had to make the executive (hah!) decision to stay home and behave myself. I even declined seeing the cria again today! I'm so dedicated to my art. Look at what I'm missing!